Update: Virgin Blue will relaunch this coming Wednesday May 4th as Virgin Australia. Previous: Virgin Blue's new Virgin Australia logo, which the airline submitted in black-and-white to the IP Australia trademark body, has been making waves, with travellers eager to see what the new airline brand will mean for them. It's unlikely that we'll see planes with a white body, red tail and white logo. That would be too similar to Qantas' Red Roo -- currently a white kangaroo on the red tail of a white plane -- both for branding and for confusion at airports. So what are the options? What has Sir Richard Branson's previous forays into the airline industry taught us? Australians are most familiar with Virgin Blue, of course, which launched with bright red planes, white tails (with blue borders) and a red Virgin logo. An evolution of that white-on-red tail -- plus the fact that the writing on the released logo is darker than the surrounding tail -- suggests a light grey or silver tail for the new Virgin Australia. The non-red tail with red Virgin logo has been seen elsewhere: on Virgin Express, a Brussels-based airline that was the second Virgin airline, after Virgin Atlantic. The airline is no more, having been merged into Brussels Airlines. As an example, Virgin Express proves that the Virgin Group isn't absolutely set on red tails. Virgin Nigeria is another airline that isn't officially a Virgin airline any more. Now called Air Nigeria, the former Virgin Nigeria name came with a 49% Virgin Group interest in the airline. The green country name in the Virgin Nigeria logo -- matching the green on the Nigerian flag -- highlights exceptions to the usual red-white-grey-purple combination in Virgin airline brands. Virgin America, which started flying back in 2007, is most frequently compared to Virgin Blue. It's an upstart in competition with established legacy airlines, and is the most recently established Virgin airline. That naturally leads to parallels being drawn between the two. With the country name in red to the right of a red tail and white Virgin logo, Virgin America is probably the least controversial of the Virgin Group's airline logos. 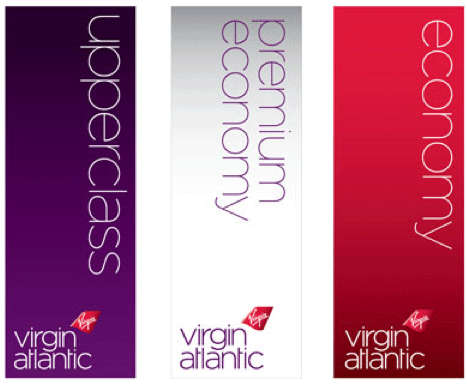 Virgin Atlantic was Richard Branson's first airline, founded in 1984 and rebranded several times since, most recently in 2010, where the old slanted typeface -- used on all the other Virgin Group airlines, including Virgin Blue -- gave way to a lightweight typography in lower case, coloured a dark purple and tightly spaced. Interestingly, while the tail logo structure moved swapped sides, changed shape and became smaller in the Virgin Atlantic logo, the tail part of the Virgin Australia logo remains more comparable to Virgin America (plus Virgin Nigeria and others). In addition to finding it on planes, expect the new Virgin Atlantic typeface to be spread around Virgin Australia's lounges, airport facilities, website, Velocity Rewards frequent flyer programme -- and printed materials. And it's a safe bet that you'll see the Virgin Australia logo on the underside of its planes too. 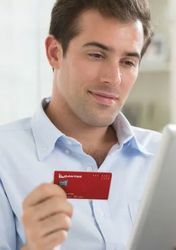 So what are the options for Virgin Australia? After some consideration, the two most likely options both involve a red Virgin logo on a silver tail. The gradient on the submitted logo implies an evolution past the current red-on-white, while the darker grey of the "Virgin" and the Qantas similarity problem nixes the idea of a white-on-red tail. 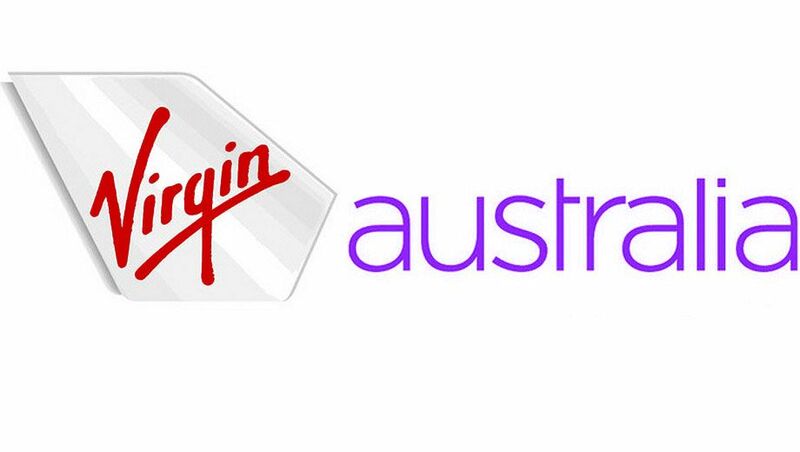 For rest of the name, Virgin Australia could go with something reminiscent of Virgin Atlantic logo -- perhaps in a more vibrant shade of purple to go with the lighter purple scarves seen in the new Virgin Australia uniforms and the headrests on the new A330 economy class seats. Another option would be an all-silver option: sleek and stylish. I quite like the idea of a purple shimmer on the tail, with a red 'Virgin' and either purple or red writing... Then have a livery which basically copied Virgin Atlantic but with the purple shimmery sort of tail. Comment on "Virgin Australia's new brand and logo: options & analysis"